So far, there is more than enough info on this 1.1 page thread to show what a dire threat the TPP is. Obama is trying to fast track it so no amendments can be made to it. He assumes they won't want to read it because of its daunting size but as a precaution he'll fast track it anyway. He's so wrong. His hubris is unbounded and only eclipsed by his absolute deceit. He's like a programmed machine. Maybe he is. People have been working on getting info about the TPP for some time and Wiki Leaks has been steadily releasing leaks about it over the years. This vid is from 2013. However, it is reaching a tipping point now and it doesn't bode well for the TPP and corporate America. The web is still free they couldn't distract us enough or control the web enough to keep what is really happening from people who can make a difference. Mike Papantonio, Ring of Fire Radio joins Thom Hartmann. Wikileaks has released another bombshell - this time publishing a portion of text from the secretly negotiated Trans Pacific Partnership. Now that the text is out in the open - will lawmakers in Washington finally realize how devastating the TPP is to the American economy? Last edited by Shayalana on Thu Mar 31, 2016 5:49 pm, edited 1 time in total. He is the only candidate opposing the TTP in no uncertain terms. Yay Bernie Sanders even though they are marginalizing him so much in the election hoping to eliminate him completely. He has influence over enough people because of this election that word is getting out about the evils of the TTP. Especially for the common people. Last edited by Shayalana on Thu Mar 31, 2016 7:17 pm, edited 1 time in total. The details are out on the the Trans-Pacific Partnership, and critics say the trade deal is worse than they feared. The TPP’s full text was released Thursday, weeks after the United States and 11 other Pacific Rim nations—a group representing 40 percent of the world’s economy—reached an agreement. Activists around the world have opposed the TPP, warning it will benefit corporations at the expense of health, the environment, free speech and labor rights. Congress now has 90 days to review the TPP before President Obama can ask for an up-or-down vote. We are joined by Lori Wallach, director of Public Citizen’s Global Trade Watch and a leading TPP critic. Here's another angle about the TPP. Today, Thursday, December 3, 10am EST, WikiLeaks releases new secret documents from the huge Trade in Services Agreement (TiSA) which is being negotiated by the US, EU and 22 other countries that account for 2/3rds of global GDP. Coinciding with the ongoing climate talks in Paris, today's publication touches on issues of crucial relevance including the regulation of energy, industrial development, workers' rights and the natural environment. WikiLeaks is also publishing expert analyses of the documents. The Trade In Services Agreement is the largest trade treaty of its kind in history. The economies of the 52 countries involved in the negotiation, which is being led by the United States, are mostly the supply of services. According to World Bank figures, services comprise 75% of the EU economy, 80% of the US economy and the majority of the global economy. Notably excluded in the TiSA negotiations are the emerging economies and the BRICS (Brazil, Russia, India, China and South Africa). The "Energy Related Services Annex Proposal: Questions and Answers" document sets out TiSA designs to create an international market in energy-related services for foreign suppliers. While heads of state prepare to sign climate accords in Paris, TiSA negotiators are meeting behind closed doors in Geneva to forge new limits on energy regulation. The "Annex on Environmental Services" reveals that TiSA will aim to ensure that national environmental protections within TiSA countries will be "harmonized down", promoting the interests of multinational companies providing water purification, sanitation and refuse disposal services over worker safety, public health and the natural environment. Assessing the agreement, Friends of the Earth calls TiSA "an environmental hazard", pointing out that public services of an environmentally sensitive nature are in danger of being privatized. Commenting on the "Annex on Road Freight Transport and Related Logistical Services", the International Transport Workers Federation (ITF) calls TiSA a "race to the bottom," observing that the Annex joins other Annexes published by WikiLeaks to form an overarching trade liberalization agenda, fragmenting the trucking industry, opening up sensitive areas of the transport sector to international competition, and contributing to the ongoing privatization of public services, undercutting workers' rights, public health and safety, and the ability of national governments to plan and direct their own industrial and infrastructural development. While the Trans-Pacific Partnership (TPP) and the Transatlantic Trade and Investment Pact (TTIP) have received attention, the TiSA is the largest component of the United States' "Big Three," the triumvirate of strategic neoliberal trade deals being advanced by the Obama administration. Together, the three treaties form not only a new legal order hospitable for transnational corporations, but a new economic "grand enclosure", which excludes China and all other BRICS countries. Today, Wednesday July 2, 2015 at 1500 CEST, WikiLeaks continues publishing documents from the secret ongoing TiSA (Trade in Services Agremeent) negotiations, with four Chapters in key areas ahead of the next negotiating round on Monday: Electronic Commerce, Telecommunications Services, Financial Services and Maritime Transport Services. All four texts include the confidential negotiating positions for each of the TiSA participating countries. Today WikiLeaks is also publishing detailed analyses on each of these Chapters, totalling 26 pages, explaining how they have changed since previous rounds, also published by WikiLeaks. The Annexes show a concerted attempt to place restrictions on the ability of participating governments to regulate services sectors, even where regulations are necessary to protect the privacy of domestic populations, the natural environment or the integrity of public services. Today's TiSA documents follow WikiLeaks publication yesterday of five TiSA negotiating texts including the Core Text, and brings WikiLeaks' overall total of published secret TiSA texts to 28. Today, 1500 CEST Wednesday, 1 July 2015, WikiLeaks releases a modern journalistic holy grail: the secret Core Text for the largest 'trade deal' in history, the TiSA (Trade In Services Agreement), whose 52 nations together comprise two-thirds of global GDP. The negotiating parties are the United States, the 28 members of the European Union and 23 other countries, including Turkey, Mexico, Canada, Australia, Pakistan, Taiwan and Israel. Today's publication happens the week before the next TiSA negotiating round that begins on Monday, 6 July. WikiLeaks is also today publishing the full agenda for next week's negotiations, which shows that discussions will focus on Financial Services, Telecommunications and the Movement of Natural Persons. WikiLeaks is also publishing a previously unpublished Annex text – the secret TiSA Annex on Government Procurement. The draft Annex aims to reduce procurement regulation to ensure that TiSA governments will not favour local services over services supplied by foreign multinationals. WikiLeaks is also publishing the new negotiating texts for three highly controversial TiSA annexes: the annexes on the Movement of Natural Persons, the Domestic Regulation Annex and the Transparency Annex. All three texts include negotiating positions of each of the participant countries in the TiSA negotiations, and illustrate developments from previous versions of the TiSA annexes, also published by WikiLeaks. WikiLeaks has also released 36 pages of our own expert analysis. While the proposed Trans-Pacific Partnership (TPP) and the Transatlantic Trade and Investment Pact (TTIP) have become well known in recent months, the TiSA is the largest component of the United States' strategic neoliberal 'trade' treaty triumvirate. Together, the three treaties form not only a new legal order shaped for transnational corporations, but a new economic "grand enclosure", which excludes China and all other BRICS countries. According to statements made in April by US Secretary of Defense Ashton Carter, parts of the triumvirate are "as important" to the US engagement with Asia as "another aircraft carrier". All three treaties have been subject to stringent criticism for the lack of transparency and public consultation in their negotiation processes. TiSA drafts are classified for a period of five years after the completion of the treaty. According to NSA interceptions of French treasurer Jean-Francois Boittin published by WikiLeaks on Tuesday "Washington is negotiating with every nation that borders China... so as to 'confront Beijing'." The TiSA Core Text shows how this negotiation aims at going beyond the GATS agreement, substantially further restricting what governments can do in services. There are far more extensive criteria for commercial firms, including foreign ones, to force governments to protect their corporate interests. Changes to scheduling bring more services than GATS under two main rules regarding commercial businesses working in foreign jurisdictions: non-discrimination in favour of local companies and market access abilities to not limit the size and shape of foreign companies in the market. The text also shows TiSA expanding the GATS agreement to include new "disciplines" such as those on domestic regulation, transparency and eCommerce. TiSA is also of great worry to developing countries, a number of whom will be bound by this agreement, as it does not give any of the GATS provisions for them, but instead gives greater protections for foreign growth into the countries, with protections for national services far lesser than GATS'. Today's publication of the TiSA Core Text adds to WikiLeaks' prior publications of numerous secret TiSA annexes. The text reveals the ideological and legal underpinnings of the TiSA, and provides the overarching context for each of the TiSA annexes. According to World Bank figures, "services" comprise 75% of the EU economy and 80% of the US economy. For a typical developing country like Pakistan, services comprise 53% of its economy. The TiSA covers the majority of the global economy. WikiLeaks releases today 17 secret documents from the ongoing TISA (Trade In Services Agreement) negotiations which cover the United States, the European Union and 23 other countries including Turkey, Mexico, Canada, Australia, Pakistan, Taiwan & Israel -- which together comprise two-thirds of global GDP. "Services" now account for nearly 80 per cent of the US and EU economies and even in developing countries like Pakistan account for 53 per cent of the economy. While the proposed Trans-Pacific Partnership (TPP) has become well known in recent months in the United States, the TISA is the larger component of the strategic TPP-TISA-TTIP 'T-treaty trinity'. All parts of the trinity notably exclude the 'BRICS' countries of Brazil, Russia, India, China and South Africa. The release coincides with TISA meetings at the ministerial level at the OECD in Paris today (3–5 June). The 'T-treaty trinity' of TPP-TISA-TTIP is also under consideration for collective 'Fast-Track' authority in Congress this month. The TISA release today follows the WikiLeaks publication of the secret draft financial services annex of the TISA negotiations on 19 June 2014 showing the aim to further deregulate the financial sector, despite widespread consensus that lack of oversight and regulation was the main cause of the last global financial crisis of 2008. Today's release confirms the ongoing determination to deregulate. Furthermore, standstill clauses will tie the hands of future governments to implement changes in response to changing environment. Today's release is the largest on secret TISA documents and covers numerous previously undisclosed areas. It contains drafts and annexes on issues such as air traffic, maritime, professional services, e-commerce, delivery services, transparency, domestic regulation, as well as several document on the positions of negotiating parties. WikiLeaks has also published detailed expert analysis of the topics covered in today's release. Browse the TiSA documents published by WikiLeaks here. Yep I'd say that BRICS poses as a real threat to the Corporate American government. Why else would they exclude them this trade agreement? The TISA negotiating texts are supposed to remain secret for five years after the deal is finalized or abandoned. Today, the secrecy charade has collapsed, and the risks to Wall Street oversight are exposed for all to see. said Deborah James of the OWINFS network. Trade unionists in Uruguay have been engaged in a high-stakes battle with pro-corporate government officials as to whether the nation should participate in the agreement. The leaked telecommunications annex, among others, demonstrate potentially grave impacts for deregulation of state owned enterprises like their national telephone company. The leak of the documents today provides direct ammunition for the “No to TISA” side. The TISA proposed TISA annex states that its rules would take precedence over the International Civil Aviation Organization (ICAO), which has far more credibility and expertise on the issue. Preliminary analysis notes that the goal of domestic regulation texts is to remove domestic policies, laws and regulations that make it harder for transnational corporations to sell their services in other countries (actually or virtually), to dominate their local suppliers, and to maximize their profits and withdraw their investment, services and profits at will. Since this requires restricting the right of governments to regulate in the public interest, the corporate lobby is using TISA to bypass elected officials in order to apply a set of across-the-board rules that would never be approved on their own by democratic governments. The documents show that the TISA will impact even non-participating countries. The TISA is exposed as a developed countries’ corporate wish lists for services which seeks to bypass resistance from the global South to this agenda inside the WTO, and to secure and agreement on servcies without confronting the continued inequities on agriculture, intellectual property, cotton subsidies, and many other issues. Today’s leaks prove the network’s arguments beyond a shadow of a doubt. Today’s leak follows others, including a June 2014 Wikileaks revelation of a previous version of the Financial Services secret text, the December 2014 leak of a U.S. proposal on cross-border data flows, technology transfer, and net neutrality, which raised serious concerns about the protection of data privacy in the wake of the Snowden revelations. The TISA is currently being negotiated among 24 parties (counting the EU as one) with the aim of extending the coverage of scope of the existing General Agreement on Trade in Services (GATS) in the WTO. However, even worse than the opaque talks at the WTO, the TISA negotiations are being conducted in complete secrecy – until now. Public Services International (PSI) global union federation published the first critique, TISA vs Public Services, by Scott Sinclair, in March 2014, and PSI and OWINFS jointly published The Really Good Friends of Transnational Corporations Agreement report on Domestic Regulation by Ellen Gould in September 2014. A factsheet on the TISA can be found here and more information on the TISA can be found at http://ourworldisnotforsale.org/en/themes/3085. Read this about regulation of telecommunications from the TISA and you might as well kiss free access to the information on a uncensored internet goodbye if these bastards are not challenged off the planet. Let them go to Mars before they get lynched on this planet. Legalese really is another language and is purposely meant to NOT be understood unless you are a lawyer or politician. There's a phrase with the acronym K.I.S.S. it means keep it simple stupid. That is so as many can understand as possible. People who work in secret and don't want you to know about the treachery they want to infflict on you will never keep it simple they will convolute and complicate things to such a degree no-one can understand it.That's what lies and deceit are about. However, if you listen to what your heart tells you for the impressions it receives about such trickery you can easily cut right through it. Last edited by Shayalana on Thu Mar 31, 2016 11:45 pm, edited 1 time in total. There should be a world tribunal that tries these corporations for their psychopathic behavior, hatred and damage on humanity and the planet. And that means putting on trial the people who run the corporations and the politicians who support them and that we totally disregard any and all laws they have brought into being to protect them from such a tribunal. They ignore us and what is suppose to protects us in law, see how they are when we do the same to them with doing the right thing on our side, and because we have so much more to lose by not challenging them. What is interesting about all this with the TTP, TISA, and TTIP, is that they have already been trying to implement various parts of them for some time now. In other words they have been seeing what they could get away with. They know if ratified they will have it in the bag even though they are acting like and doing things like its already in the bag. We need to render such a big hole in their bags that they will never recover from the leakage. I think its a happenin. Murder is part of the TTP especially if the person poses as a threat to doing business "trade agreement style". It's happening in South America. GUSTAVO CASTRO was the sole witness to the murder on March 3 of Honduran activist Berta Cáceres, the co-founder of the Civic Council of Popular and Indigenous Movements of Honduras (COPINH). Castro, the director of Otros Mundos, an environmental organization in Chiapas, Mexico, was also shot in the attack. After being barred from leaving Honduras, Castro was released on March 30 and has since settled in an undisclosed location. Last week he spoke by phone to The Intercept about the night of the murder and the reasons why environmental activism in Latin America is so dangerous. Castro’s experience over the past month provides a remarkable glimpse into the Honduran justice system, which is notorious for its culture of impunity. In the months before her murder, Cáceres repeatedly said that she was being harassed by Desarrollos Energéticos, SA (DESA), the private energy company behind the Agua Zarca dam project, which she had vigorously opposed. After the murder, Cáceres’s family immediately pointed to DESA. On March 31, the Honduran public prosecutor’s office announced that it had seized weapons and documents from DESA’s office and questioned several employees. What happened during your last hours with Berta Cáceres? I arrived on March 1 in San Pedro Sula, and that day they put me up in another home that belongs to other COPINH members in La Esperanza. It had been years since I had seen Berta in person, although we had been in touch by email. I was there to facilitate a workshop on environmentalism. That day Berta said to me, brother, come to my house, I have internet so you can get in touch with your family. We spent a while talking, even discussing the threats that she had received in the past and in recent weeks — intimidation and threats to her safety by employees of DESA and people who seemed to be hit men contracted by DESA, the company behind the hydroelectric project called Agua Zarca. And I said to Berta, this is a very isolated home, how is it that you live here alone? So I decided to stay the night. I started to get ready for the second day of the workshop, and she was in her room. At midnight, there was a loud bang on the door and immediately one hit man entered my room, and simultaneously another entered hers. Everything happened very quickly, within 30 seconds, in which simultaneously they assassinated her and shot me. They had clearly been following her and were expecting her to be alone, so I think it surprised them to find another person there and they didn’t know what to do, so they just shot me and ran away. I don’t know about the other one, but the one who shot me wasn’t masked. I wasn’t able to decipher his face well, but that’s the moment when I became the principal witness, and a protected witness. When Berta told you that she had received threats from DESA and Agua Zarca, did she say at any point that the people threatening her were from Honduran state security forces? Or were they gang members, or just random individuals? I don’t remember her saying anything like that. She did say they were employees, people in favor of the company. In fact when I arrived in Mexico, on March 30, the public prosecutor’s office in Honduras published a press release publicly linking the company to their line of investigation. In the press release they also announced that they had seized weapons and questioned some of the company’s people. But they didn’t want to get to this point. Before coming to that line of investigation, I got the impression they wanted to see if another line of investigation could be useful or believable for national and international public opinion, but that was impossible. Everyone in COPINH already knew the recent history, so they had no other option than to finally go after the company. I’m unaware of any advances they’ve had in this line of investigation. 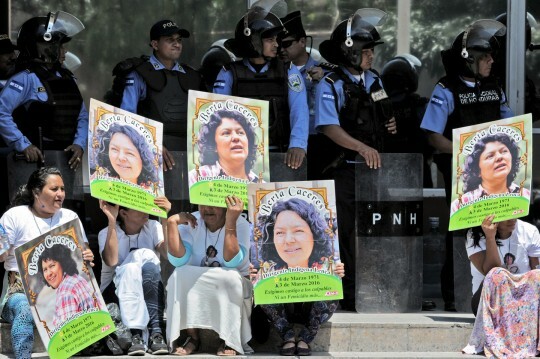 Over the last decade there were more than 100 murders of environmentalists in Honduras. And these conflicts are often linked to the army and the police. That’s part of the reality of Honduras. In this specific case, Berta said that the guilty party was the company. It was the company with which she had a strong and direct confrontation. leader Berta Cáceres in Tegucigalpa on March 17, 2016. At first we were hearing that they questioned you, took you to the airport, and then suddenly told you that you couldn’t leave the country. Is this how it happened? The whole process was confusing and handled poorly. I spent the first three or four days in constant legal procedures in La Esperanza. I could have refused several times, because one has the right to solicit a six-hour prevention order as a victim and a protected witness. Nevertheless I never used this instrument, and every time they asked me to take part in more legal procedures, I did — at any hour, in the middle of the night, whenever. So I went nearly four days without sleeping. I gave the statement for the attorney general, the statement for the public prosecutor, medical examinations, cross-examinations, photographic identification, etc. And, yes, at first they said I could go. They always said, just one more thing, and then just one more thing, and then it finally seemed like everything was done and ready. They even prepared a helicopter for me to get back to Tegucigalpa on March 5. But because of weather conditions they weren’t able to land the helicopter, so instead they deployed a security detail to accompany me to Tegucigalpa by land. Later, the public prosecutor’s office claimed I was trying to escape, which was a huge lie. So I arrived at the Mexican Embassy, where the ambassador and the consul bought me a plane ticket for March 6 at 6:20 a.m. But when we got to the airport, Honduran officials were waiting in hiding around the airport for me, as if this were necessary, as if this were a criminal matter and as if I weren’t a protected witness and a victim. It was so shameless. It felt like having an army at my heels. And the ambassador and the consul were with me. Suddenly eight or 10 people from the attorney general’s office and the public prosecutor’s office stood in front of the door and said that I couldn’t leave. They wouldn’t hand over any official document explaining anything. I know that this government is the result of a coup, but this game was so ridiculous that even they had to ask for apologies from the ambassador and me. What they did was totally unnecessary. And obviously they had to justify themselves before the national and international press by claiming they thought I was fleeing. Even then I could have said I was leaving. Because of a convention on penal matters between Mexico and Honduras, as a victim and a protected witness, I had the right to participate in the legal procedures from Mexico. I’m not a criminal — I’m a victim. But they forgot that. They said, we need just one more thing. So I asked for more protection for the ride back: a bulletproof vest and more bodyguards. What they originally said they needed was more testimony, but what it ended up being was more cross-examination. At the end of the night they produced a document saying it was necessary for me to stay 30 days more. That was also illegal — the judge used arguments based on international human rights laws regarding suspects. When my lawyer argued they were violating my rights, the judge not only removed her from the case but furthermore suspended her ability to practice law for 15 days. The government wanted me under its control. It has no laws that protect victims. Nor does it have regulations or protocols or a budget to protect human rights activists. Nor does it have regulations for protected witnesses. So they wanted me under their so-called protection where there is no law that obligates them to do anything. Which is why I stayed in the Mexican Embassy. But it was a month of horrible stress and tension, in which the government, with its complete lack of regulations or protocols, could easily accuse me of anything at any moment, show up with a judicial order, and the Mexican Embassy wouldn’t have been able to do anything. One week before I arrived in Honduras, the Judicial Commission had been dissolved, so there was no legal instrument with which I could defend myself. There was no commission before which I could denounce a judge who acted illegally, because that commission had been dissolved. So I found myself in total legal defenselessness — without a lawyer, because they suspended her. And it seemed neither international pressure nor the Mexican government could do anything. So it was a state of complete insecurity and a constant violation of my human rights. Did they ever try to accuse you of anything officially? There wasn’t anything explicit. There were rumors in the press that the public prosecutor’s office was trying to justify involving me in the crime in some way. But with the evidence and my declarations, it was simply impossible for them to invent such a farce. No matter how many circles they ran around the matter, they eventually had to go to DESA. They had no other option. I had the sense that they wanted to keep me there while they were trying to find something. It was a horrible uncertainty, because you have no lawyer. They have the ability to leave you totally legally defenseless. How do you explain the fact that opposing dams is interpreted as a threat? This isn’t true only in Honduras — also in Guatemala, Mexico, Chile, etc. One of the reasons is that these dams mean flooding out huge swaths of jungle, forest, and indigenous and campesino lands. And this causes a strong reaction from these communities, because there are thousands and thousands of them displaced violently. Another reason is that one of the most profitable businesses at the moment is the sale of electrical energy, especially in Latin America, because free trade agreements are opening huge investments for transnational corporations. And what does this mean? For example, free trade agreements allow major investors to put up factories, industrial parks, infrastructure, and mines, which all consume a ton of electricity and a ton of water. And bear in mind that one gold mine can use between 1 and 3 million liters of water every hour. That implies relinquishing the water that belongs to communities, their rivers, and their wells — using it to instead generate electricity for the big industrial corridors. So the sale of energy, and thus investments in energy, is one of the most profitable businesses for big capital. But that means entering into battle over territory with campesino and indigenous communities. Additionally, with the Kyoto Protocol they’ve invented the stupid idea that dams make “clean energy.” Thus in order to gain carbon credits and reduce their greenhouse gases, wealthy countries started investing in dams. That’s why we have a world full of dam construction. In Latin America almost every country has free trade agreements with the U.S., Canada, and Europe, and many also with Asia. This means changing your constitution, your environmental legislation that concerns water, energy and foreign investment, in order to adopt and facilitate these free trade agreements. If you don’t, companies sue. For governments, it’s easier to repress people than to pay damages and compensation to corporations. A good example is the case of the gold mine in El Salvador. El Salvador has had to pay millions to defend itself against a mining company before the World Bank’s International Centre for Settlement of Investment Disputes. And we are talking about one mine. But imagine 10,000 or 15,000 — we are talking about thousands of mining concessions in the region. And to this if you add dams, and to that you add highways, ports, airports, mines, fracking, petroleum, huge shopping malls, tax-free zones, charter cities, huge elite tourist resorts — there are so many concessions. If the human rights claims that activists make are actually upheld — contamination of water and land, violating previous and informed consent of communities — or if they kick out a company for dumping toxic waste into rivers, for murdering community members, for causing cancer around mining sites like we’ve seen in Honduras, Mexico, Guatemala — if governments have to do something about these human rights claims by kicking out the extractive industry, they’ll have to pay millions and millions of dollars that they don’t have. Each country would have to sell itself 20 times over to pay off the debt. So this is not easy to solve. This leads to confrontation with communities. This will only deepen with things like the Trans-Pacific Partnership, and governments prefer to react by criminalizing citizen protest. Peaceful protest used to be a human right. Now they call it “terrorism,” “violence.” They’re criminalizing human rights. In a recent interview, Hillary Clinton said that the coup in Honduras was legal. What do you think about this statement? It seems to me that in the end, the government had to justify a way for another group to come to power. And Honduras’s legal antiquity allows you to make any argument you want. For example, one of the reasons they gave for overthrowing Zelaya was that he proposed to modify the constitution to allow for re-election. Which the current president, Juan Orlando Hernández, is now trying to do, to modify the constitution to allow for re-election for him next year. So that’s why I say it depends on how you want to see it. If Zelaya proposes it, it’s unconstitutional and he has to go. If the oligarchy and the global hegemony says it, it’s legal, it’s democratic. How do you see your future? Or are you living more day by day right now? More day by day. Many are asking me if I’m going to throw in the towel, if I’m like the boxer who can’t take any more and gives up. I say no, I’m picking that towel up. This struggle must continue. I am not alone. Across Latin America there are thousands of people who are criminalized, who are being persecuted and threatened for defending human rights, who are defending the well-being of our planet. We must realize that that no one is exempt from this criminalization. Like so many friends who have been murdered for resisting. But there are many of us, and we will carry on. The voracious capitalism we face cannot continue as is, with its accelerated and extractionist logic that is finishing off our planet. I think our great challenge is to realize that other worlds are possible. We can build something different, something dignified and just. There is enough water for everyone. There is enough land, enough food for everyone. We cannot continue feeding this predatory system of capital accumulation in the hands of so few. That system is unsustainable. So from wherever we are — in the Americas, in Europe, in Asia — we will all be affected by this system. Sometimes it seems that the crisis doesn’t touch certain places, and sometimes we don’t make the structural link to capitalism with the crises that the U.S. and Canada and France and Spain face. But I hope that we realize this soon, because it will affect us all sooner or later. And I want to say that there is still time to do something. This is urgent. The news media and advocates of the proposed Trans-Pacific Partnership (TPP) trade agreement have repeatedly described opponents of the deal as “protectionist” or opposed to trade itself. But opposition to the TPP is not accurately described as opposition to all trade, or even to free trade. In fact, the deal’s major impact would not come in the area of lowering tariffs, the most common trade barriers. The TPP is more focused on crafting regulatory regimes that benefit certain industries. The U.S. International Trade Commission’s own report on the agreement notes that “few tariffs remain between the United States and its existing [free trade agreement] partners,” which compose a majority of TPP countries. It’s true that past trade deals such as the North American Free Trade Agreement (NAFTA) have dramatically lowered tariffs, freeing companies to move manufacturing jobs out of the country. And as a result, the very notion of trade agreements has left many Americans understandably skeptical. One of the proposed TPP rules, for instance, involves the expansion of copyrights, which would impose anti-competitive costs on economies. The agreement has been harshly criticized by humanitarian organizations like Doctors Without Borders, which deploys thousands of doctors overseas to offer medical care to those who cannot afford it, because it expands monopoly protections and patents for various pharmaceutical drugs. For instance, the agreement requires the countries involved to offer eight years of market exclusivity, or five years plus other mechanisms, to assure “comparable market outcome” for a class of pharmaceutical products called biologics. These cutting-edge, biologically manufactured drugs have been used to treat Crohn’s disease, arthritis, and other common ailments — and expanding market exclusivity means there is less room for competitors to produce lower-cost generic drugs to compete. The TPP also seeks to strengthen and extend monopoly patents for the entertainment industry. Disney played a major role in lobbying for a 1998 law that extended copyrights for media creations. Congress’s 1998 rule change was a boon to Disney, which was due to lose its Mickey Mouse copyright in 2003. Thanks to this law change, which opponents derided as the “Mickey Mouse Protection Act,” Mickey’s copyright was extended to 2023. The TPP seeks to expand on that, establishing a global Mickey Mouse Protection regime. U.S. Trade Representative Michael Froman made a trip to Hollywood in May to remind a trade group that the TPP would require countries to lift their copyright terms to the 70-year standard in the United States. This would be an increase from 50 years, the current standard in many of the countries that are part of the negotiation. Yay! In one fell swoop Trump killed the TPP! The various renditions of it in Europe and elsewhere will follow suit since it was to be led by the US globally.